Biotech USA Protein Power is a great whey protein powder blend for dedicated athletes looking for high protein content. Like all BioTech USA products, Protein Power consists of safe and carefully selected nutrients. Prepared with high quality milk and soy proteins, Protein Power delivers a whole range of BCAAs, L-Glutamine and other essential and non-essential amino acids. 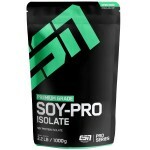 Its protein content contributes to the growth and maintenance of the muscle mass. Biotech USA Protein Power is available in 1kg and 4kg sizes. Maximise your efforts and make the most of your workout. Protein Power contains three types of proteins: soy protein isolate, whey concentrate and calcium caseinate. 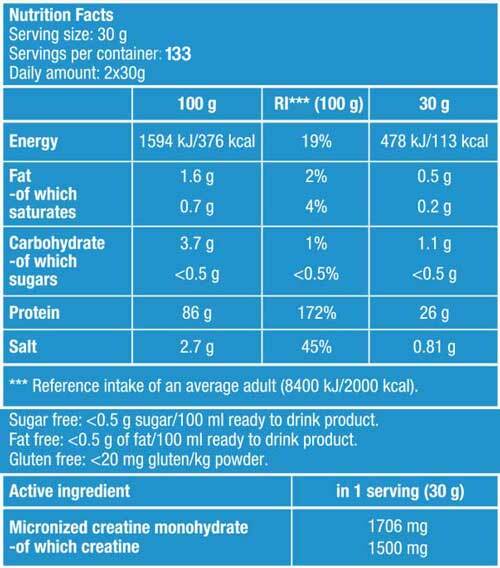 Besides still being gluten-free, of course, the new formula is now not only free of sugar and lactose, but also of fat. The product also contains added creatine. **The above information only applies to vanilla and strawberry-banana flavoured products. Chocolate: Protein Blend 71% [soy protein isolate, whey proteinconcentrate, calcium caseinate (contains milk)],fat-reduced cocoa powder, flavour enhancer (glycineand its sodium salt), micronized creatine monohydrate5%, flavourings, anti-caking agent (magnesium saltsof fatty acids, silicon dioxide), salt, emulsifier: lecithins(soy), sweeteners (sucralose, acesulfame K), thickener(cellulose gum). Strawberry-Banana: Protein Blend 81% [soy proteinisolate, whey protein concentrate, calcium caseinate(contains milk)], flavour enhancer (glycine and itssodium salt), micronized creatine monohydrate 5.7%, flavourings,anti-caking agent (magnesium salts of fattyacids, silicon dioxide), emulsifier: lecithins (soy), acid (citricacid), sweeteners (sucralose, acesulfame K), salt, thickener(cellulose gum), colour (Allura Red AC)**. **Allura Red AC:may have an adverse effect on activity and attention in children. Vanilla: Protein Blend 82% [soy protein isolate,whey protein concentrate, calcium caseinate(contains milk)], flavour enhancer (glycine and itssodium salt), micronized creatine monohydrate 5.7%,flavourings, anti-caking agent (magnesium salts offatty acids, silicon dioxide), emulsifier: lecithins (soy),sweeteners (sucralose, acesulfame K), salt, colour(tartrazine)**. ** Tartrazine: may have an adverseeffect on activity and attention in children. Made ina plant that manufactures milk, egg, gluten, soy, crustaceans,sulphur dioxide and nuts containing foods. WARNING: The product does not replace a varied andbalanced diet and a healthy lifestyle. 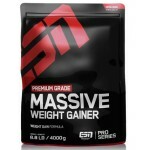 ESN Soy Protein IsolatePerfect plant bas..
ESN MASSIVE WEIGHT GAINER ESN Massive W..